Our Assorted Brazilian Agates are all hand-crafted. We select only the best agate slabs. 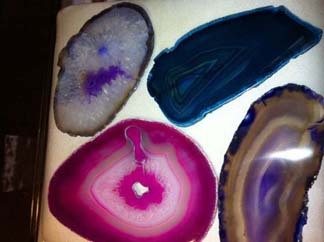 Each agate slab is unique in color, markings, shape and design.slabs are approx. 3-4 inches wide . They come in various colors-Pink-Purple-Blue-Tiel-Natural.